The colder, wetter stuff is showing up a little more often now as autumn gets into full stride and winter looms. I’ve certainly noticed a (slight) drop-off already in the numbers biking to school and work, as the shadows lengthen and the fair-weather bikers seek alternative travel means. First up, for those wanting a few hills to tackle, the Cycle Tourists Meetup group are doing a MTB ride from Rapaki to Sumner. Meet at the bottom of Rapaki Track (St Martins) at 10am on Sat 5th May for a ride up and along Summit Rd. On Sun 6th May you are spoiled for choice for river rides. First up is a Ladies’ Sunday Bike Ride along the Avon River red zone, with Lady Legends speakers Sara Templeton and Sophie Allen along to share some insights into what’s planned for the area. Meet at 10am in front of Avonside Girls High (Avonside Dr). Then in the afternoon Lazy Sunday Cycle then bring you a Family Ride along the Upper Heathcote, a cruisy ride along the quiet river streets and paths of Cashmere and Beckenham. Meet at 1pm in the South Library carpark, Colombo St.
On Mothers Day (Sun 13th May), Go Cycle Chch will be offering a Cycle Skills session for less confident adults from 10.30am at the South Hagley netball courts. This is then followed at 11.30am by a guided Confidence Ride through the city centre, where you will get a chance to test out those new-found riding skills. If you need an opportunity to brush up on your cycling skills then come along to one or both of these events! Fri 18th May sees the return of what is becoming a regular fixture in the annual calendar – the Big Bike Film Night. Starting from 7.30pm in Charles Luney Auditorium, Merivale, come along and watch a dizzying collection of interesting cycling-related short films from NZ and around the world. Tickets are selling out quick – better get some soon! Frocks on Bikes Chch team up on Sun 20th May with their dapper gentlemanly colleagues for a Tweed Ride through the inner west of the city. 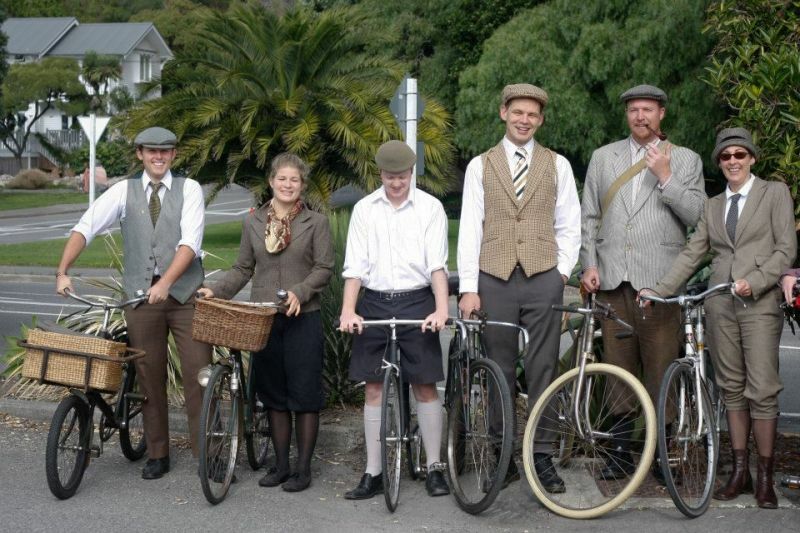 Dig out your finest threads and meet up at 1pm by the Armagh St Gates of North Hagley Park for a jolly good ride. Huzzah! Finally, the end of the month is time for some annual meetings of local cycling groups. 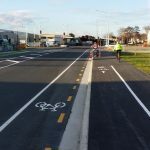 First the Chch Coastal Pathway have their AGM on Thu 24th May from 7.30pm (Sumner Surf Club); then advocacy group Spokes Canterbury are holding their AGM on Wed 30th May from 5.30pm (Quaker Centre, Ferry Rd). Come along if you would like to know more about these group’s activities, or to get involved more; there will also be guest speakers present. Will you be taking part in some biking activities this month?